Thought that shale gas companies were focusing only on the North? Well think again! Cuadrilla has announced that they plan to start drilling a test well in Balcombe starting in June where they will be looking for shale oil. Although Balcome parish have promised to not allow any further fracking to take place in their local council, Cuadrilla previously secured planning permission to drill. Their license to drill expires in September and as it is make-or-break time for the industry they have to start drilling now. 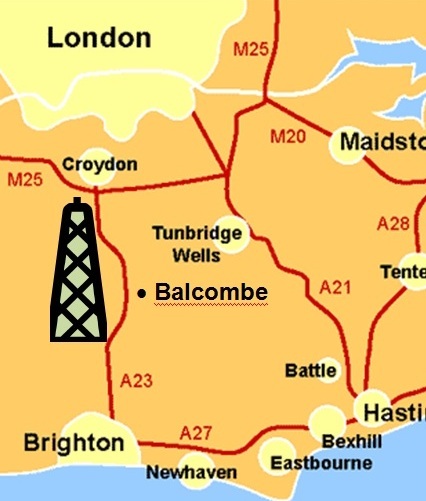 Balcombe is located between London and Brighton. In fact the drill pad for this well is located within 100 meters of the main London to Brighton rail line. 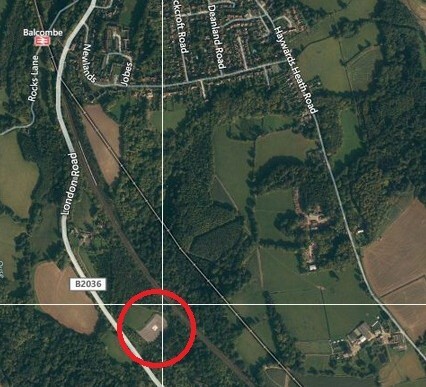 If you look closely at the pictures below, you can clearly see the frack pad right next to the railway line marked in gray. So the next time that you’re off to Brighton, don’t be surprised if you see a drilling rig outside your window! Some may wonder why all of the fuss if they council has promised to not give them permission to frack. After all 85% of the local residents are against fracking. But with the new Growth and Infrastructures Bill that has received royal assent, industrial projects like fracking that are considered of national significance can bypass local planning permission and only have to be approved by the government. So even though the local residents are dead set against having fracking or any other form of unconventional fossil fuel extraction in their communities, the government has the right to force it upon them anyway. That doesn’t sound very democratic to us! Surely the communities who are being impacted most by these projects should have a say in whether or not they are built. Along with drilling for shale oil, the industry say that they will use flaring at Balcombe among other sites. Flaring is a process by which excess methane gas is set alight and allowed to burn off. As you’ll see in the video below, this process is very loud and can last for days. There are also envrionmental concerns about the amount of excess greenhouse gases being released into the atmosphere via this process. Many of the local residents have vowed to fight back. Although the company is attempting to reassure everyone that they are only test drilling, we all know that they will start fracking the moment that they find anything there. Now is a perfect opportunity to stand up against this industry and let them know that we will not allow for this to happen here or anywhere else! Next postFracking Excluded from Growth and Infrastructures Bill!